Hail Satan, NBA fans! It’s August and nothing is happening! Except the root-and-branch destruction of the rookie class of 2014, that is. Yes, somewhere along the way, these young men ran afoul of the powers that rule the universe, which visit us only in dreams or in the broken-glass gargle of Tom Thibodeau. How else to explain this litany of fractures, sports hernias (ouch! ), anti-rookie biases, and sundry other injuries and events that have plagued much of the class of 2014? Peer into the dark cauldron of blood with me now, IF YOU DARE. 1. Andrew Wiggins — Has thus far escaped unscathed, unless you count LeBron preferring to play with Kevin Love. 2. Jabari Parker — Tore his ACL 25 games into a probable rookie-of-the-year campaign. Went on to star in the second-best injury-rehab-centric sports commercial after Derrick Rose. 3. Joel Embiid — Like many non-medical professionals, I’m not really up on anatomy nomenclature. You know, like, other than the obvious stuff. The foot, and its various constituent bones and parts, specifically, are anatomical deep cuts. Which is why it was troubling to know the name of the bone — the navicular — on which Embiid had surgery a mere six days before the draft. Embiid spent last season gaining understandable weight, and he now needs a bone graft on his slow-healing navicular. 4. Aaron Gordon — Missed a sizable chunk of his rookie season after surgery on his broken foot. This July, he broke his jaw while “horsing around” with his brother (and former Sixer) Drew. “I am deeply saddened and sorry for hurting my brother. I love him and my family more than anything,” Drew said in a very personal statement on Twitter that totally wasn’t written by his agent and/or manager. 5. 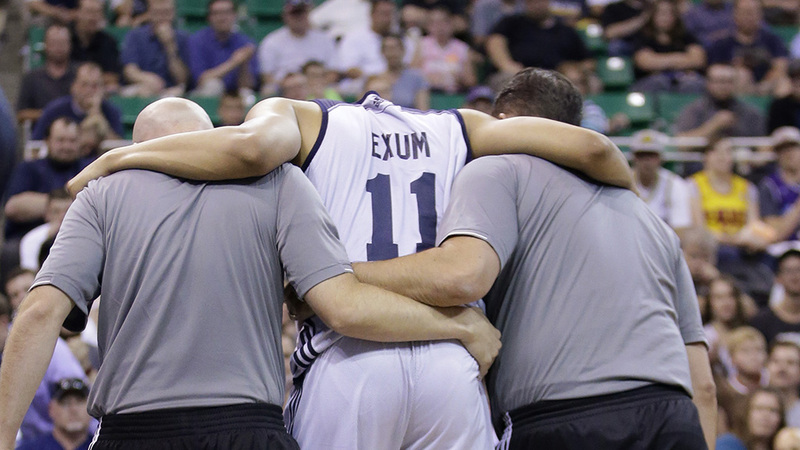 Dante Exum — Tore his ACL in an exhibition against Slovenia. Danny Chau will likely miss the entire 2015-16 season. 6. Marcus Smart — Had his fingers Lionel Hollins–ized in summer league. 7. Julius Randle — Broke his leg in the fourth quarter of his first NBA game and missed the opportunity for Byron Scott to not play him enough. 8. Nik Stauskas — Was drafted by the Kings. 10. Elfrid Payton — Can’t shoot, but he’s fine. FOR NOW. 11. Doug McDermott — Played only sporadically because Thibodeau is biased against rookies, causing rumors to swirl that McBuckets’s basketball coach father called the Bulls’ front office to complain. Which, considering Thibs’s then-relationship with the front office, would be like calling the DEA to complain about cocaine. 12. Dario Saric — Is in Europe due to The Process. 13. Zach LaVine — Won the slam dunk competition. 14. T.J. Warren — Cracked a bone in his thumb. 16. Jusuf Nurkic — Had knee surgery at the end of May. Is still the dude. 20. Bruno Caboclo — Five years away from being five years and five months away from making topical musical references. 21. 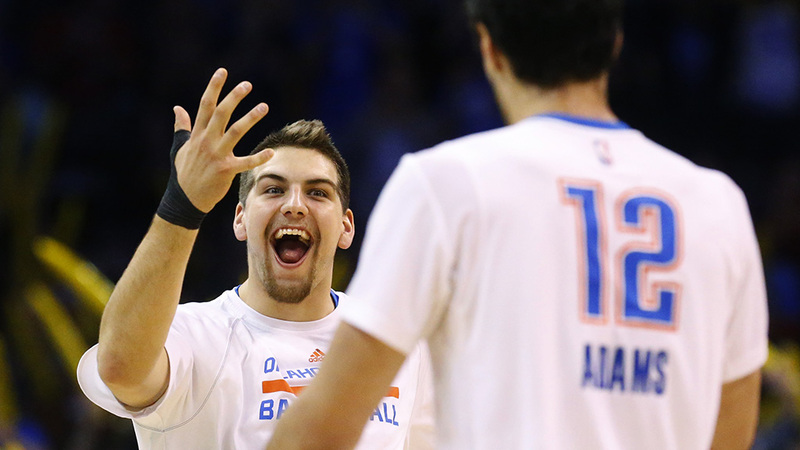 Mitch McGary — Had back surgery in college, tested positive for weed during the Sweet 16 (I would argue that getting to the Elite Eight while high is, if anything, an accomplishment of sorts), then missed a bunch of his rookie NBA season after breaking a bone in his foot that isn’t the navicular. Still the best bench celebration guy in the league. 23. Rodney Hood — The tendons in his feet are apparently made out of rubber bands slathered in sriracha hot sauce. He’s currently nursing a sore shoulder. 24. Shabazz Napier — Was (allegedly) only drafted by Miami because LeBron tweeted “My favorite player in the draft. #Napier.” To be fair, James did use a hashtag, so Miami totally had to trade three picks to move up to grab Napier. Once LeBron returned to Cleveland, Shabazz became an orphan of sorts, and he has since been traded to the Magic. 25. Clint Capela — Shoots free throws like he’s Steve McQueen in Papillon seeing the sunlight for the first time in months. Otherwise he’s fine. 26. P.J. Hairston — Was involved in an altercation with a 17-year-old at a pickup game. Signed with an agent who was basically not an agent and who was therefore not certified to do any agent things. Did this. 27. Bogdan Bogdanovic — His brand will forever be diluted due to the presence on Earth of Bojan Bogdanovic. 30. Kyle Anderson — Couldn’t outrun a glacier but will probably be fine because the Spurs can turn a toaster into a 10-and-10 guy.